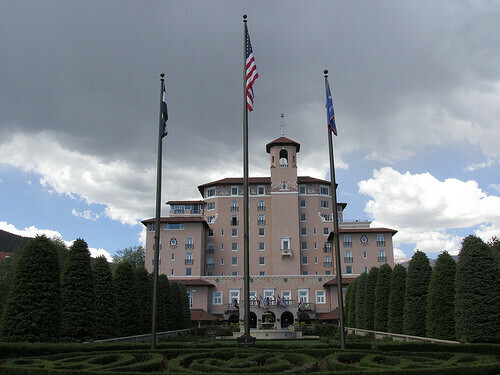 The Broadmoor is the grand dame of hotels in Colorado Springs. She holds the title of the longest running Forbes Five Star and AAA Five Diamond property in the state of Colorado and the entire country for that matter. Since she opened on June 29, 1918, the historic property has not wavered from its distinct title. The hotel is located on 3,000 acres of property that includes 779 rooms, several golf courses, a glorious spa, and enough restaurants, lounges and cafes to feed all of Colorado Springs. The epitome of luxury in Colorado Springs,The Broadmoor is an upscale base camp for outdoor explorers and sports enthusiasts alike. Only a 30 minutes drive from the resort and into the mountain is the new Ranch at Emerald Valley. A continuation of the property, the all-inclusive ranch offers horseback riding, biking, hiking and fly-fishing centered around 100,000 acres of Pike National Forest. Dip into the lake or soak in the lakeside hot tub after a day of adventure. While I have yet to review the ranch, there are 10 cabins on site with wood burning fireplaces (something you don’t see often in California due to our “spare the air” rules) and a dedicated ranch staff. While the exclusive camp is 8,200 feet in elevation, you won’t be “roughing it” in Emerald Valley. Want to get even higher? For the true outdoor enthusiast, Cloud Camp is a new all-inclusive, 54-guest resort that sits 9,200 feet a top Cheyenne Mountain. Paying homage to the original Cheyenne Mountain Lodge built for founder Spencer Penrose, Cloud Camp is part of the Broadmoor Wilderness Experience, offering 360 degree views of Colorado – a true rocky mountain high! If a more relaxed outdoor setting is for you, the resort has luscious golf courses on property. During the summer, complimentary golf clinics and tennis round robins are offered during the week. After some serious outdoor adventures, this place is sure to satisfy your culinary craving. If you love cooking, check the website for the yearly Barbecue University, but make your reservation long in advance! After adventures and indulging in the nature that is Colorado Springs, the spa is the perfect place to unwind. The mountain-view room and terrace which overlooks the golf course sets the scene for the kind of treatment I received at the spa. It offers indoor and outdoor pools, hot tubs, steam room, sauna, aromatherapy and fireplace rooms. The room I stayed in (and the entire West building) had recently experienced a complete renovation. My king room with a petite Juliet balcony and Lake Cheyenne view rented for $465 per night. For those of us who travel with our dogs, the hotel does allow pets for a charge of $50 per night. Although the hotel and room are exquisite, a daily resort fee still exists. This service charge for $32 includes local calls, local paper, high-speed internet, Fitness Center access and several daily fitness classes, incoming faxes, movies, in-room beverage service, housekeeping, turndown nightly and more. 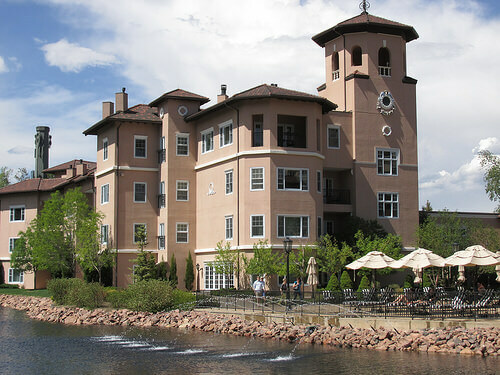 The Broadmoor offers one of the best luxurious getaways, along with its Five Star reputation. 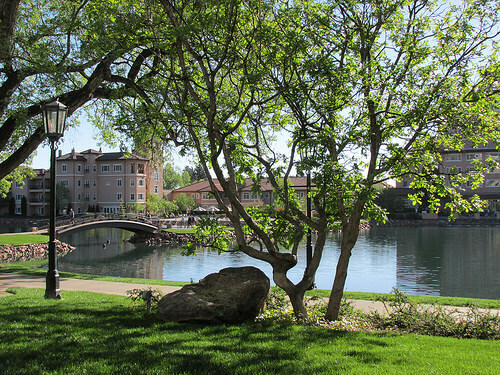 The resort is a member of Historic Hotels of America. You can book your stay through the Preferred Hotel Group website. 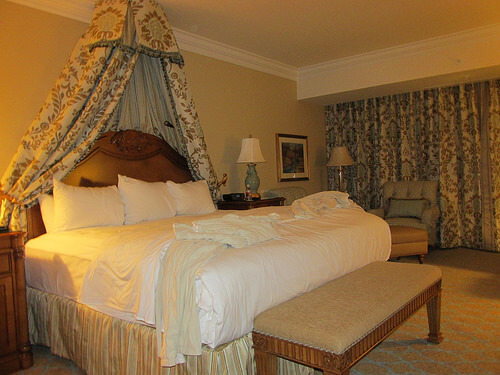 Hotel review and photos by San Francisco-based hotel reviewer Nancy D. Brown, who was a guest of the resort while researching a Colorado Springs travel story for another publication.